What can Babs do for You? One Source for all your casting needs. Pattern design and product cost reduction consulting. Shalco SCB-9 and Redford HP-43 shell core box capabilites. Experienced squeeze molders for short production runs. Squeezer flask sizes up to 20" x 20". Hunter HMP-10 (14" x 19" flask size) molding machines for high production runs. Electric Induction melting to lower production cost and improve casting quality. Robotic grinding cell and hydraulic trim press for accurate and consistant trimming of high volume castings. Providing deliveries to accomodate your just-in-time needs. 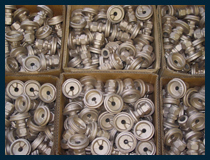 Reduction of casting defects resulting in labor and machine time savings for our customers. Over 40 years of foundry experience. Copyright© 2010 Babs Foundry, Inc. All Rights Reserved.